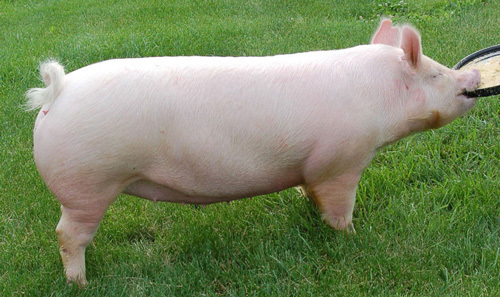 The American Yorkshire is a breed of domestic pig and is the American version of the Yorkshire pig (now known as the English Large White pig). Yorkshire pigs are white and have erect ears. The modern Yorkshire is very muscular, with a high proportion of lean meat and low backfat. They are also very sound and durable animals. Yorkshires are classified into three types: large, middle, small. Only the large type of Yorkshire pig has ever gained any prominence in the United States. The Yorkshire breed was developed in Yorkshire, England. In 1761, Robert Bakewell became interested in a local tribe of hogs known as the Leicestershire breed and he molded them into a large, useful hog that became popular in England. In 1851, Joseph Luley, one of the greatest breeders of his time, showed a team of his Yorkshire hogs in the classes for the Large White Breed where they immediately attracted widespread attention. Yorkshires became more than just a breed of local repute, but one of national recognition. Yorkshire pigs owe much of their fame in those early years to the herd of N. Wainman of Carhead. One day Wainman was riding by as a working man was walking his sow during the mid-day dinner break. Delighted with the look of the pig, Wainman bought it from the working man on the spot based on what Wainman described as an uncontrollable impulse. That pig was a descendant of Luleys animals and it is through her descendants that some of the entries of the first pig herd book can be traced back. Wainman’s pig became the dam of Cheimsford Duchess, the first Carhead winner at the Royal Show, and one of the first, if not the first Yorkshire pig to be exported. In 1884 the National Pig Breeders Association was founded with Lore Moneton as its first President. The Association began the task of compiling an annual volume of the Pig Herd Book. Today, Yorkshire hogs are classed as belonging to the Large White breed, but prior to that they were just listed as Yorkshires. In the United States around the early 1920's, the Morrell Packing Company of Ottumwa, Iowa, and the Hormel Packing Company of Austin, Minnesota, tried to promote Yorkshires to farmers in their surrounding areas. After World War I, the market for lard was quickly vanishing and Yorkshires failed to gain popularity with farmers in these areas due to their slow growth rate and short, pugged noses. However during the late 1940s, the pig industry experienced a period of rapid breed expansion and demand in the United States. A large percentage of Yorkshires were imported from both England and Canada where the breed had been very popular due to their large carcass and having a greater substance, ruggedness, and scale than other breeds of pigs. All of these qualities made the Yorkshire very attractive to pig breeders in the United States. Importing pigs with these strong qualities allowed the United States to meet consumer’s leaner meat/pork demands. Yorkshire breeders have also led the industry through the utilization of the STAGES genetic evaluation program. From 1990-2006, Yorkshire breeders submitted over 440,000 growth and backfat records and over 320,000 sow productivity records. This represents the largest source of documented performance records for pigs in the world. Today the Yorkshire is the most common breed of pig in the United States and Canada. They are found in almost every state now, with the highest populations being in Illinois, Indiana, Iowa, Nebraska and Ohio.